Merry Christmas to all! We are all home together as a family away from the hospital! We hope to update soon! Give your kids an extra hug and kiss for us! We have been home for a week tonight from Philly and it is nice to be home. The last time I updated, I indicated that Emily had a MIBG Scan before she left Philly, many just call this a "super scan" because it only takes 15 minutes and because she has so much iodine in her body that it won't take as long. The iodine in her body would quickly attach to the NB Cells in her body and would show on the scan and this is what they were looking for to make sure it was working. Monday we had received an email that indicated that they had received the results back and the "super scan" showed 2 others spots which had uptake in them. These two spots were in her left tibia and her upper abdomen. While they didn't make a big concern of this, because they expect to find uptake in other spots when they do the "super scan" what they want is when she returns in 6 weeks that the Therapy is working and the spots are either smaller or gone. While I hate to hear that she has others spots and they worry me, I am trying to realize that the MIBG Therapy is one of the most effective type of therapys that there is and we just have to know that this will work for Emily. The time home has consisted of Emily being extremely tired and really not eating much. Tuesday she had clinic and we thought for sure that she would need blood, because she just seemed so tired and no energy. Even the nurse thought she would need blood but then she looked at her palms and said they were not white. When the CBC came back, it was great actually, her hemoglobin had gone up from 7.9 to 11.2, however her WBC and platelets were dropping. So, they sent us on our way wearing a mask just since her ANC and WBC was dropping. Friday she had clinic again, and the past few nights before clinic Emily was asleep early and still very tired. Just extremely exhausted and would get winded very quickly. She also lost 2 pounds within a weeks timeframe, and Emily can't afford to lose any weight whens he is already underweight. CBC came back with hemoglobin still 11.4, platelets dropped to 20 and WBC same as Tuesday, ANC is going down just a bit. 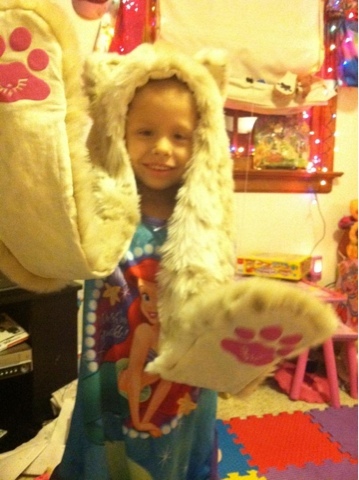 Emily had to receive her first round of platelets since the MIBG Therapy. They say this is normal, because many kids need platelets normally within 2 to 3 weeks, however with Emily she received MIBG Therapy very soon out of Stem Cell Transplant, so all of her counts were still on the rather low end when many other kids are much higher. Dr. Gowda said that the low energy levels and not eating much could be side effects from the actual radiation she received at VCU. We were kind of surprised it is just now hitting her in the past week or so, but the extreme exhaustion and not eating is what has us concerned. She does still seem to have the cough that she had when were in Philly when she received MIBG therapy, but doing ok.
Once Emily's ANC hits 750, they will either give Emily the Neulasta shot. By doing this, this is in hopes it will help get her counts back up. 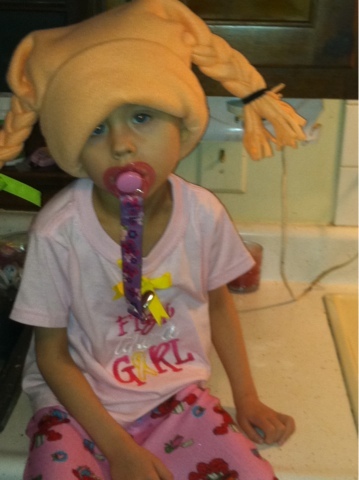 Should her counts not go back up, we may have to give her a bag of Stem Cells. Friday night Emily was asleep by 630PM. Saturday we decided to celebrate our Thanksgiving and get up and make Turkey and all the fixings. Thank you to Whole Foods and the Goss' who gave us a gift card and we had a great Thanksgiving together as a family and even enjoyed having family over while Emily's counts are still ok. Emily enjoyed helping making the turkey and everything else. She loves to cook and keeps saying she wants a Kitchen Aid Mixer. It is amazing that she loves to watch the cooking channel. Thanks Dennis and Kim for spending the day with us. Today we had a pretty laid back day and Emily had a playdate come and hang out with her today, thanks Jessica and Aydan, we enjoyed having adult interaction and all the kids enjoyed having someone over to play. We are thankful that her counts were still not immunesupressed and she could have a friend over, even though she was tired. Doug and I were both pretty surprised that in the middle of playing, she stopped and came and fell asleep. When she got back up, she played for a little while, but not long after they left, did she fall asleep and is out for the night. Emily did continue to say she was hungry several times today and we made several different meals hoping that it would spark her to eat, but she didn't eat much. She did eat a bowl of mac and cheese that I made yesterday for Thanksgiving, so that was good that she did eat that. I'm hoping that her energy levels come back soon, because this is something that Doug and I are just not used to, because with all the treatment she has been through, we have never really had this issue before. So, it is really hard to see her so tired and even look so tired and not eating. We look at her and she is extremely thin. We will continue our twice a week clinic checks to check Emily's counts and see if any transfusions are need or anything else. Friday we did ask Dr. Gowda why they didn't use SSKI at VCU and he explained that the iodine that they use, they didn't have to. After talking about how Emily was feeling and if we needed to do anything additional, he said he wanted to check Emily's thyroid levels again just to make sure they were ok. If we have to, we will start Emily on fluids and we have started her on Periactin which is supposed to help get her to eat. We also told Dr. Gowda about the two other spots that the "super scan" found and he was really surprised about the upper abdomen spot that was found. Overall,. it is great to be home and enjoy family time. Doug has started decorating outside for Christmas, however we still haven't gotten the Christmas tree out. Continue to send your thoughts and love and hope that Emily continues to do well and does not get neutrapenic and she land back in the hospital with fevers. So, we just continue to make sure that she doesn't get sick or anyone around her is sick. We continue to send out our thanks and love to so many who continue to pray for us, send their love and thoughts, gas cards and donations. Our hearts are just amazed at the generosity of those that many we do not know and those we do know. So, thank you so much! We are hopeful that her counts stay up this week and she continues to do well! Give your kids lots of hug and kisses!